Many tropical destinations are overrun with tourists, overpriced, or both. Bali is neither. Bali is the most popular island in the Indonesian archipelago and is one of the most incredible destinations on the planet. 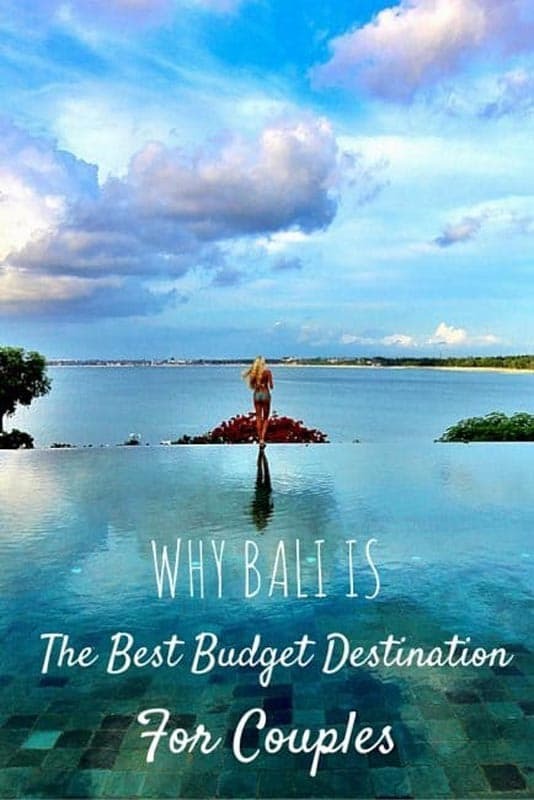 Not to mention, it's easy to travel Bali on a budget for couples and single travellers alike! We have literally never been somewhere in the world where we felt as if we were getting a better value for our dollar. You not only have incredible purchasing power in Bali ($1 = about 14,000 IDR), but you also get quality products and services. Imagine a beautiful island where goods and services are very affordable. As one might expect, this means that everything from guest houses to 5-star resorts are built for luxury and at a fraction of the cost they would incur in a place like Hawaii. You can find beautiful home-stays with pools and gorgeous gardens with hospitality to rival the islands’ best resorts. Most of the good home stays also include breakfast and provide for your room to be cleaned and restocked with toiletries on a daily basis. If you've been reading Couple's Coordinates for a while now then you're familiar with our love of Airbnb. However, in Bali, we prefer guest houses and resorts. FYI, our favorite guest houses ranged from $30-50/night. 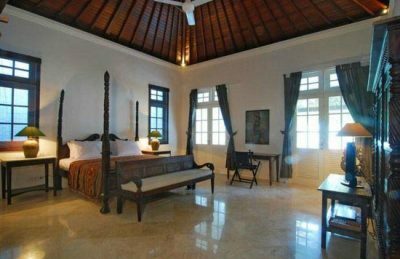 If you stay in Sanur, be sure to check out Kolonial House, this is where we spent a good majority of our time in Bali. In the US you'll generally spend about $75-150/hour for a half-way decent massage. This used to be normal for us, but now we have a very, very hard time paying for more than a Chinese foot massage/Thai massage. In Bali you can go to a luxury spa and get 90 minute couples massage for $13 each. You'll even enjoy essential oils at no additional cost and delicious tea following your massage. 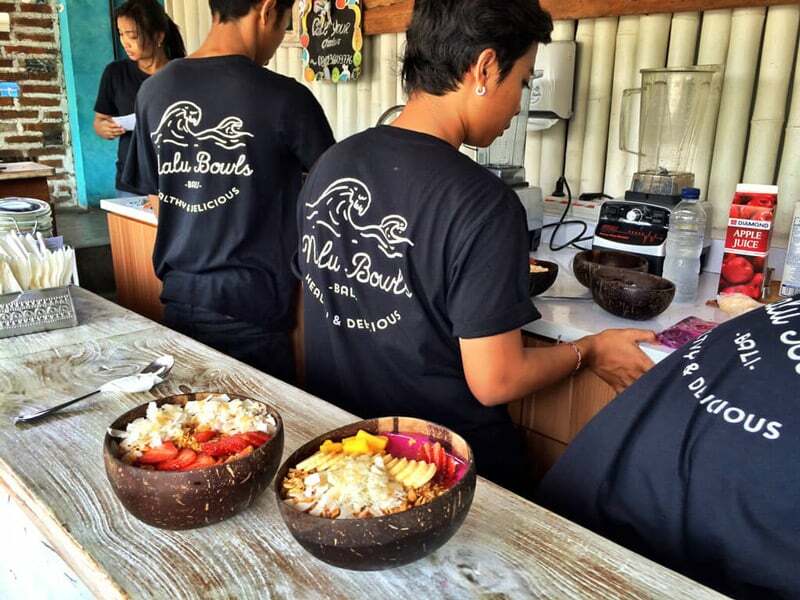 Our favorite spot is located in Sanur and is called Leha Leha. This place literally gives some of the best massages we have ever had in our lives. If you happen to be in that area, definitely check it out! Your body will thank you. Always wanted to surf but never wanted to pay the hundreds of dollars for a board and lessons? Fear not, in Bali you can rent a board and your very own teacher for around $10 an hour. Surfing together in Bali is one of our fondest memories together. Pretty much every beach in Bali with good surf will also offer simple board rental for about 50k IDR - 100k IDR or about $3.50 - $7.00. A bit of advice - if you can rent "booties" as well, do so. Bali's reef is beautiful for snorkeling and scuba diving, but it is also very sharp. Back home we go out to eat very sparingly as we are always saving money for our next adventure. Well, in Bali, eating out can cost as little as $2 per meal! Sure, restaurants at 5-star resorts are comparable to restaurants in the States. However, local cuisine is super affordable and wonderfully delicious. Even the touristy restaurants in town shouldn't cost more than $10/person. We would typically spend about $10-15/night for a dinner date at one of our favorite restaurants. Just about every village has awesome restaurants that line the beaches, so you have tons of delicious romantic options. 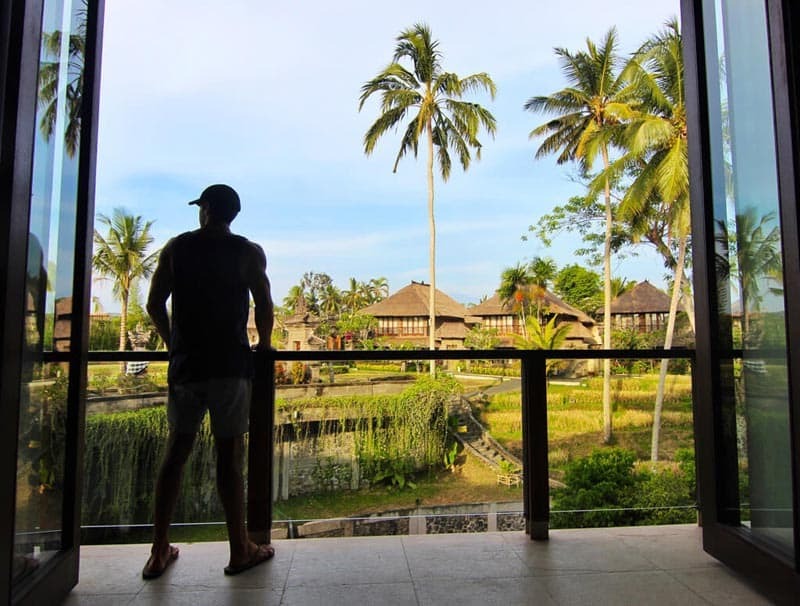 Get the Royal Treatment in Bali on a budget! 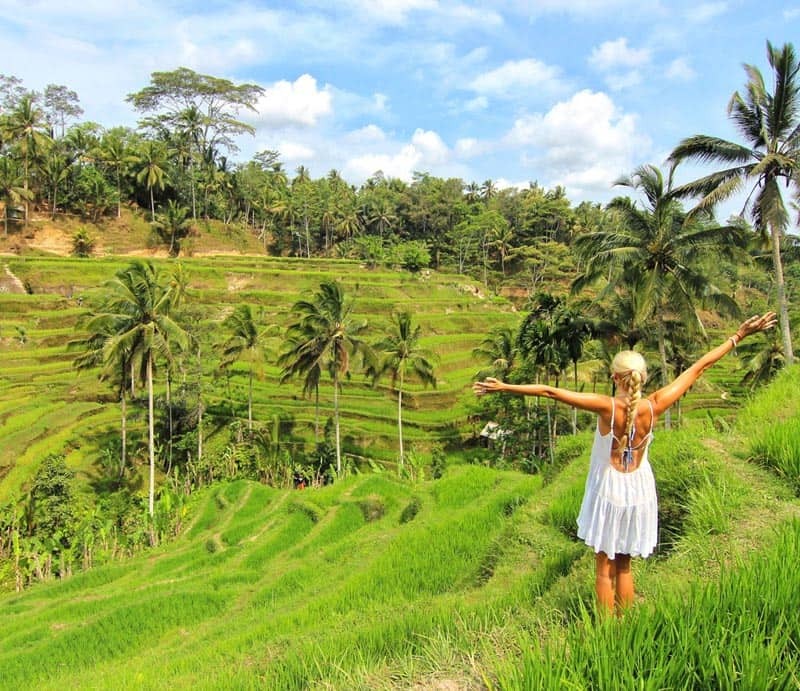 The Balinese people are the most benevolent, friendly, and hospitable people we have found on the planet. This goes for just about everyone on the island and of course for individuals in positions of service. Whether it is the aforementioned massages or simply a server in a restaurant, the people treat you like royalty. 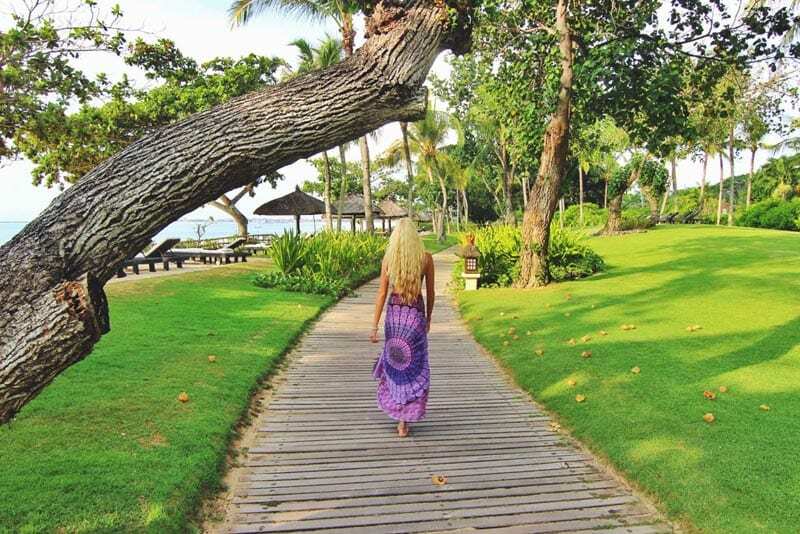 You'll make an incredible amount of friends and will feel as if you and your partner are royalty as you are hosted by the wonderful people of Bali. This is a bit of a follow-on to the hospitality of the people. 97% of the Balinese people are Hindu and the people are very adamant and devout in their religion. You can attend religious celebrations/ceremonies/festivals on a weekly basis for FREE and can have an incredible cultural experience. The awe-inspiring Hindu culture are easily understood through the Balinese people’s aim of living life in accordance with the four main goals of human life: Dharma, Samsara, Karma, and Moksha. You’ll love experiencing their culture with your partner! For being a small island positioned in the middle of the Indian Ocean, Bali is actually fairly accessible. If you fly into Singapore or Tokyo, you'll be able to reach Bali fairly easily. It's going to be a long haul from the US, but flights from Singapore are super cheap and flights from Tokyo aren't bad; especially if you're leveraging miles. 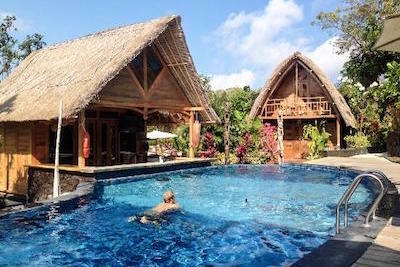 Taxes on reward flights from Bali are also very affordable. We redeemed Delta miles to travel from Bali to Tokyo on our way back to the States and paid only about $20 in taxes per passenger. If you fly into Singapore, you'll be able to catch a 2.5 hour flight to Bali for only about $100. So think big picture, especially if you're traveling on a budget. Don't only look at your final destinations' airport, think about more major cities in the region - this is a great way to save a great bit of money on flights. 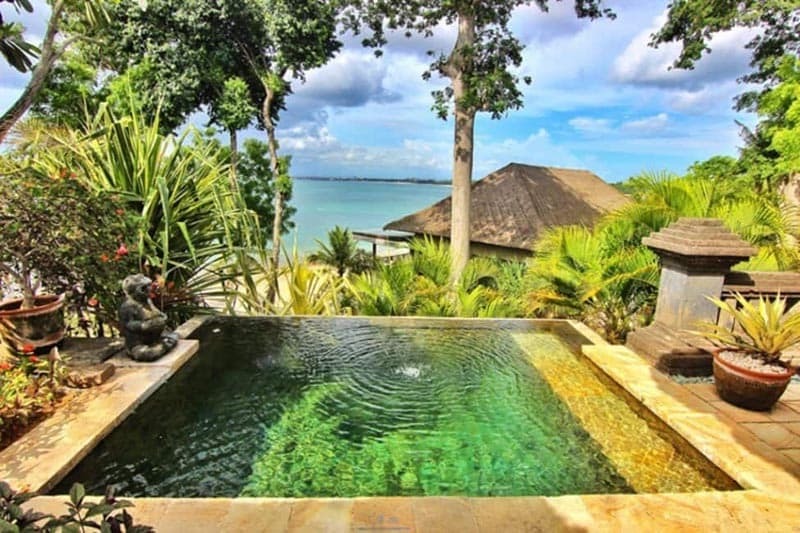 Booking.com has over 6,500 properties in Bali, Indonesia. You get free cancellation on most rooms and a best price guarantee. Suggested Places to Stay when you are in Bali. 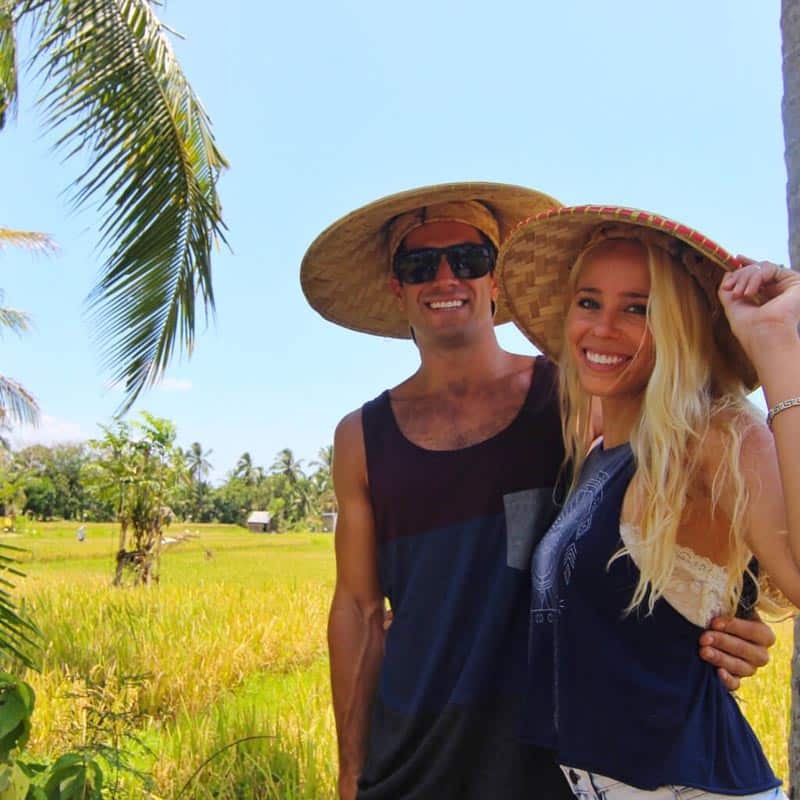 For more specific information on Bali, check out our Couple's Travel Guide to Bali. Hey there! We are Michael Gallagher and Alexandra Carson from Southern California. We began dating in May of 2013 and quickly discovered that we both had a passion for travel and adventure. For 2 years we packed our weekends full of hikes, mini-vacations, music festivals, and whatever sorts of adventure we could manage to accomplish in 72 hours. But that wasn't nearly enough for our vagabond souls. Finally, we took a leap of faith. We bought a one-way flight to Italy, quit our jobs, and set off to pursue our passion of travel with only about $8,000 to our names. Yeah, you could say we took some risks. Couple's Coordinates is the story of our fairy tale adventure and your go to destination for all things couples travel, city guides, travel tips, and romantic getaways. 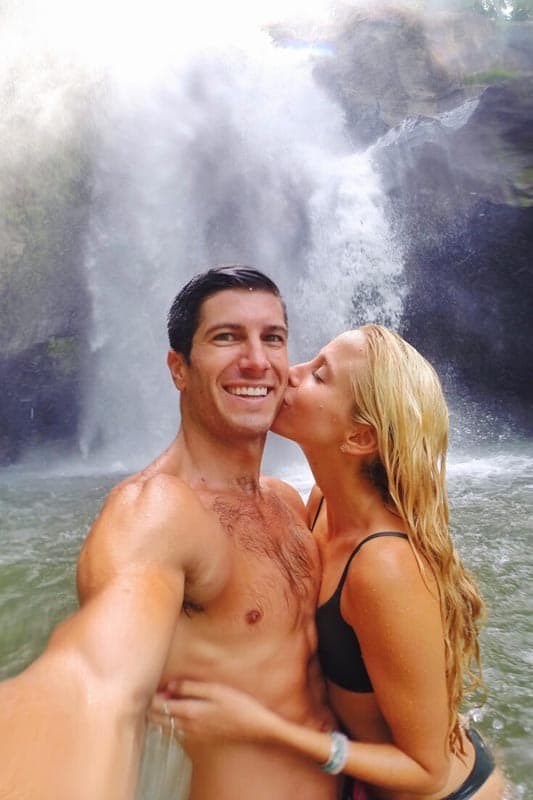 23 Responses to "Bali on a Budget – Why it’s the Best Destination for Couples"
Your article is great! I was there with my girl last year and it was awersome! We had rent villa on siamluxuryvillas.com with the minimal budget. Bali is definetly for young couples! 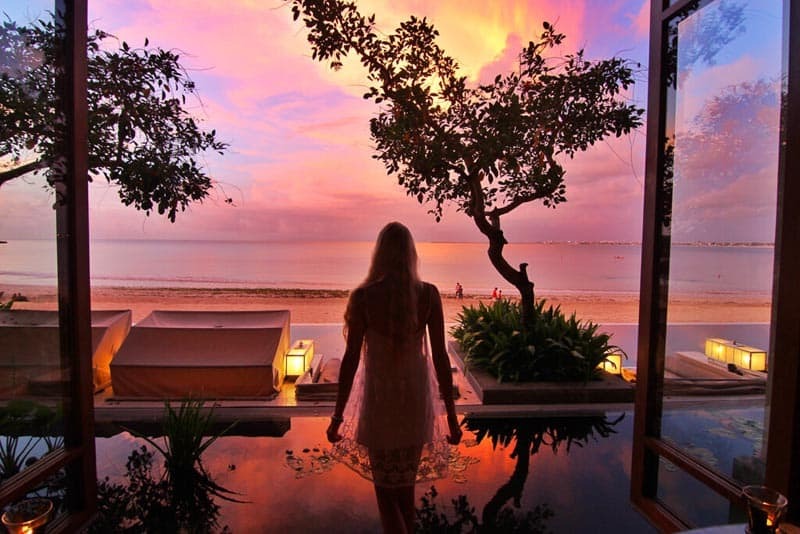 What’s your opinion on all inclusive resorts in Bali? In fact, the beautiful scenery in Indonesia are not only founded at Bali but also at several places. But Bali is the most well-known tourism destination for many tourist around the world. Great Article! Heaven is real, Thanks for sharing your experience. 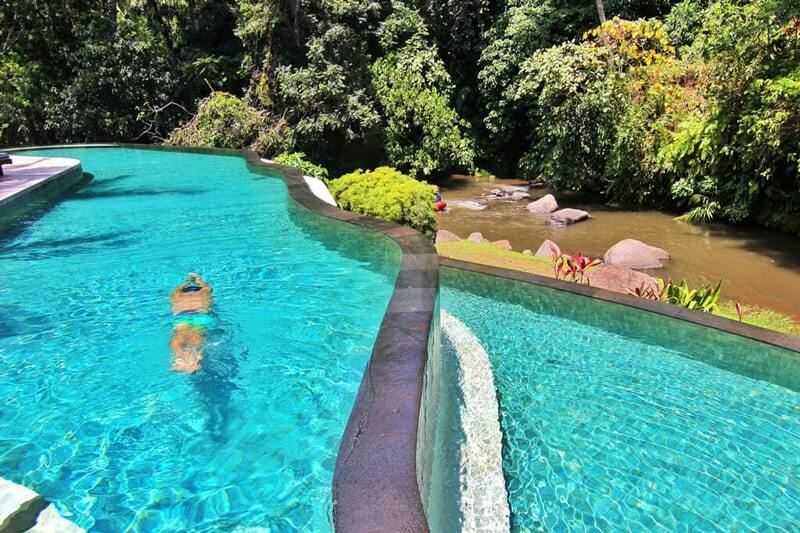 Amazing destinations for couples. Super romantic places. Hi my name is Ted and I’m looking for something special in terms of a place to go. I’m happily married and African American, not seeing any in your pictures. My wife and I are in our mid to late 60’s and in relatively good health. I do have a spirit of adventure but like to be ridiculed What would you suggest? Great photos, seems to be a good spot for couples. Wow, great post, thanks for your sharing. Great ! Me & My Hubby are planning for a Vacation trip, but we are not sure about the Location, It was a great dilemma about the place , May be I could suggest my hubby “Bali..! !” – Thank You ! I suppose I should go back. I spent a week there in October 2015 and truly didn’t like it. Perhaps worth giving it another try! I never forget Bali, Because that is my Honeymoon destination. Such a nice and green place I never seen. That was a sweet memories. Lucky you! We’ve only been to Bali once in 2004, after this article, I can’t wait to go back. It looks like it has changed a lot. We have our motorcycle license now, this time we’ll be able to rent a bike with confidence. In 2003 we had a bad moped accident that kept us off bikes for a while. Thanks for sharing your expertise on Bali! We can’t wait to go back again. Thank you guys so much for giving us the opportunity to share a bit of our story with your readers! So glad to have the chance to work with you guys.